The largest onshore wind farm in Europe, Whitelee in Scotland, faced severe opposition during the planning process because of likely radar interference. Scottish Power and BAA, with the assistance of Pager Power, worked closely to identify a site for a new radar from which aircraft flying into Glasgow airport would be seen but no turbine would be visible. This case study explores the specific challenges that lay ahead and how 322 MW of clean energy was finally achieved. Whitelee wind farm in Scotland is the largest onshore wind power development in Europe, with the final phase having been completed in May 2009. Scottish Power had faced significant objections from BAA when applying for consent for the 140-turbine project south of Glasgow. This was due to the perceived effect of the development on the radar systems at nearby Glasgow airport. Scottish Power determined that an additional data feed from an existing radar might offer an effective mitigation solution. The radar at Edinburgh airport was considered, but line of sight analysis demonstrated that the radar would not provide the required height coverage in the Whitelee area, due to terrain shielding. Pager Power offered to find a suitable site for a new radar, from which none of the turbines but the visibility of aircraft flying into Glasgow would not be compromised. The large site area and the wide variations in terrain elevation made this task even more difficult. Custom software was modified and an area of over 25 000 km was analysed using a complex iterative process, which ran for a number of weeks on a multi-processor server. The computer model was refined as suitable zones were identified, and more complex analysis was carried out. A number of potential sites were surveyed with access, local blocking (such as forestry) and power supply issues being considered. This resulted in the identification of three technically suitable sites: one in Kincardine, one in Kintyre, and one in the southern uplands of Scotland. Discussions between NATS (BAA’s technical advisor) and Pager Power determined that the Kincardine site should be the preferred option because of access and radar coverage. Scottish Power already had a suitable site in Kincardine and Pager Power and NATS both carried out analysis which confirmed that this specific site was suitable. The new Kincardine Bridge was another issue that needed to be taken into consideration. The fix mentioned above is commonly known as ‘data fusion’. 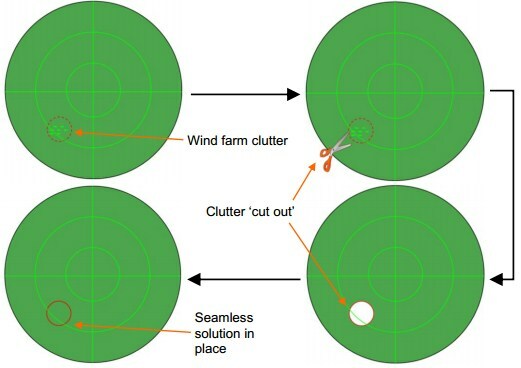 A simplification of this technical mitigation is provided below but essentially the process involves ‘cutting’ a hole around the affected area of Glasgow radar, taking this out and replacing it with the unaffected Kincardine radar feed. Although the exact details of who paid for data fusion and how much it cost are not publically available it is expected that it will have cost in the region of £3,000,000 – £5,000,000 and that the developer will have paid over 90% of this cost. The turbines at Whitelee now generate 322 MW of power, sufficient to provide electricity to virtually every home in Glasgow, and preventing emissions of over 650 000 tons of carbon dioxide every year from fossil fuels. An additional 36 turbines have already been consented by the Scottish government and further expansion plans for Whitelee are currently under discussion. Whitelee wind farm proves that when aviation stakeholders and developers work together mitigation solutions can be found that allow wind farms and radar to coexist.